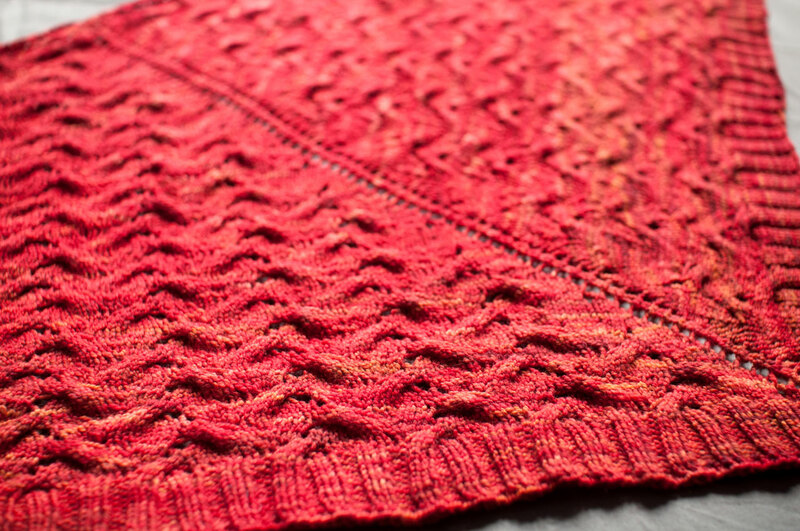 A purl stitch in the middle of an ocean of stockinette. Now, if this was in an inconspicuous place on the skirt, I might’ve left well enough alone. But no, it was smack dab on the front. What to do? Why, snip it. All fixed, although now I’m not quite sure how to hide those ends. I’ll think about it later tonight. What else…I’ve been working diligently on the purple socks, because I want to get them done. And some yarn – cotton, viscose and silk. It’s sportweight (24 sts/4″). Any suggestions for summery tops? Try garnstudio.com., they have some really nice patterns with euro flare. While the pattern are published in norweign, they have a pretty good translation dictionary and http://www.spellingtuesday.com/ has excellent instructions on knitting in Norwegian. I think Safran would be about the same weight as your pingouin. Ha, very interesting. As brave as I am in other respects… I don’t think I could ever bring myself to do what you did. I’d rather unravel hours and hours of work, sobbing… pass the tissue :). you not only have incredible eye sight, but are clearly far more commited to the art than I. Maybe commitment isn’t the problem, maybe laziness. Yes, I am lazy. More lazy than you. but bravo on the fix.